The Sunbeam Alpine is one of my all-time favourite cars from the 60s. I have never owned one, but, I do know many people who do. I am not going to pretend I know everything about the Alpine, but I do know many chaps with beards that know an awful lot about this little piece of history. I am writing this, because I don’t want people to forget that we were once the best of the best when it came to producing the best sports cars. So, this is not a review as such, but more a timeline of how the little Sunbeam had changed in its eight years of production. The Sunbeam was such a British icon back in the day it would not have been out of place parked outside the Borgata Hotel Casino in Atlantic City or the Casino de Monte-Carlo to name but a few. Of course it would have been driven by Mr Bond accompanied by a very good looking lady. 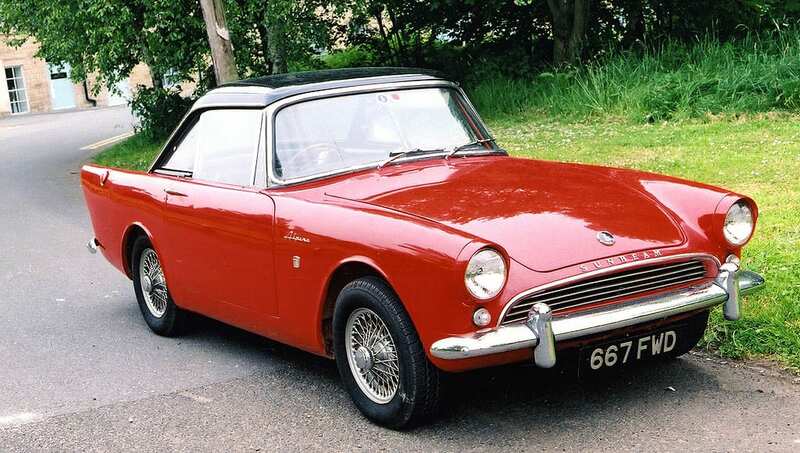 The original Sunbeam Alpine was designed by George Hartwell in 1953 as a Sunbeam-Talbot, the result of mergers between Sunbeam, Darracq and Talbot. It was also referred to as the Talbot Alpine. Only 3,000 of the first generation Alpines, powered by a 2267cc 4-cylinder engine were manufactured, because the production only lasted two years. Most of them that got built were left-hand drives and mostly exported to the United States. To this day, a few still survive in the US. The Alpine name, previously used by Sunbeam on the earlier car, was revived for an all new sports car design. In 1956, Ford-trained designer Ken Howes and his partner, Jeff Cromptom, were asked to redesign the Alpine, so it would appeal to the American market. The end result was a more sharply detailed and better looking roadster that bore no resemblance to the first generation Alpine. The new Alpine debuted in 1959 as a two-seater roadster, Based on a Hillman Husky floorpan, and using the 1494cc (78bhp) 4-cylinder engine from the Sunbeam Rapier. This new and attractive sports car was welcomed by the media and the buying public of the 1960s. The series II model that was launched in 1960, was given an increase in engine capacity from 1494cc to 1592cc (80bhp), making it perform better than the outgoing series one. In 1963 a Series III Alpine was available with the option of a GT model that featured a hardtop and 2+2 seating. All series III cars were also fitted with twin fuel tanks and larger servo assisted front disc brakes. January 1964 brought with it the next in the series – the series IV. The series IV had its tail fins redesigned and a different front grille fitted, and in October 1964 the Alpine received a new synchromesh gearbox. The final version was the Series V which began in 1965 and continued until 1968. It was fitted with a larger 1725cc engine, and twin Zenith-Stromberg semi-downdraught carburettors. In all, about 70,000 of the roadsters were produced before Rootes introduced its Alpine fastback in 1969. The Alpine fastback was actually a rebadged 1968 Rapier fastback coupé. The fastback was produced until 1975. But by then, the Chrysler Corporation had purchased Rootes and ended the Alpine’s production. This of course was a bitter disappointment to many who had been involved from day one. For me, this is a story that starts off well but ends with utter sadness. The UK was once the sports car manufacturing capital of the world, but now it’s all but gone – along with most of the buildings -and the people who helped Britain become one of the best producers of sports cars in the world. A Vehicle’s History – why is that so important In today’s world?